On the weekend our eldest boy received his first Holy Communion along with 38 other children at one of four first Holy Communion Masses at our parish this month. That’s a lot of boys fidgeting in their suits and girls shivering in sleeveless white dresses and sheer veils. Our boy looked handsome in his blue suit, white shirt and matching white satin tie. Though chilly outside, it was a sparkling sunny day. The inside of the church got quite warm, packed as it was with extended families, godparents, and friends of the children to witness their final Sacrament of Initiation into the faith. The delightful. The excitement of our four-year-old, who greeted his biggest brother in the morning with a “Happy First Communion Day!” And the moment the six-year-old after asking me for a gift to give Joachim presented it with a big hug, which was sweetly accepted and returned. Or so I am told. I was still wrapping gifts in another room and missed this extremely rare moment of sibling bonding that my husband was lucky to witness. Then, much later in the day, there’s the way our extended family are simply awesome at just turning up with food and presents and hanging out with us and generally making any special occasion feel extra special. The amusing. I passed a little girl who was sitting very still at the very front of the church a few minutes before the Mass began, encased in a splendid white gown and veil and with perfectly sculptured hair. A woman (presumably her mother) was making final adjustments to the ensemble. The expression that was on the girl’s face is hard to describe; not quite scowling, but disinterested, or maybe exhausted? I got the sense that she had endured a long day already. There was the mildly chaotic bustle during the wait for Mass to start while every family deftly or otherwise negotiated individual seating rights and obligations within its allocated pew. Larger extended families (like ours) made diplomatic attempts to occupy strategic bits of unclaimed seating real-estate, while later arrivals resigned themselves to lining the walls. When the Mass got underway one man was quickly revealed who had thought to compensate for the ‘take photos from the pews only’ rule by bringing a very long selfie stick. At every peak moment when he stood up with it, effortlessly hoisting his phone above everyone’s heads, approximately 350 people probably mentally kicked themselves for not bringing one too. I know I did. Still, I managed to capture from behind the moment that Joachim received the Eucharist for the first time. Grace-filled. The priest gave a great homily. He talked to the children about Jesus, his personal love for them, and the way he ensured his presence in the Eucharist for them. 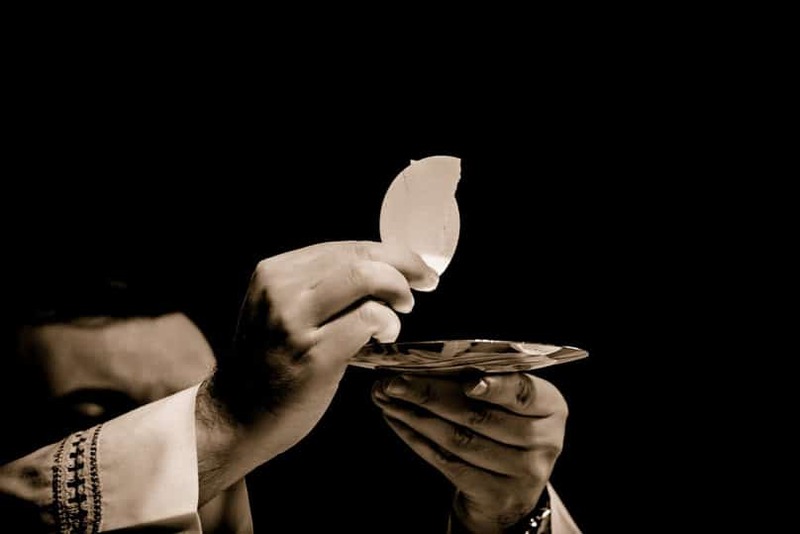 He told them this is a beginning, not an end, of their journey with Jesus; that he is always with them, not only in the Eucharist, but in a special way present there. He reminded them to look for the tabernacle light in a church for confirmation of this presence. He welcomed and affirmed all of the grown-ups, encouraged us in our own journeys and asked us to support the children in their spiritual lives. But mostly he spoke to the children, in a very warm and friendly way, sitting down on the sanctuary step with them collected around him. Just as Jesus would have done, I expect. This was also a perfect photo opportunity if ever there was one. Selfie stick man took advantage. Frustrating. Our son was excited before the big day and in the morning, and serious and thoughtful during Mass. Though by the end he was bored and as eager to get back home to his little after-party as you’d expect from a nine-year-old who had spent two hours total in a crowded church. He didn’t really want to pose for a photo after the Mass, but I told myself that we still had a gorgeous cake at home and his sacramental gifts for props. Except that long before cake-cutting time he had changed out of his suit and back into his favourite trackies and hooded dressing gown. C’est la vie! It’s lovely that every Sunday from now on, another person in our family will join us in receiving Holy Communion. At bedtime our beautiful boy told me that of all the great and varied gifts he received, there’s one more he would like that somehow got missed; a daily prayer devotional. I assured him he’d get one soon then, of course. In all, it was a perfect beginning.